This stunning crystal has exquisite colour and very vibrant energy. It also has the added benefit of being a 'Window' formation crystal. A 'Window' crystal is one with a diamond shaped ‘window’ in the centre front of the crystal. The top of the diamond will connect with the line leading directly to the termination. The side points of the diamond will connect with the angles forming the opposing faces. The bottom point will connect with a line leading to the base of the crystal. These unusual crystals provide a window on the ‘otherly’ worlds; to the higher realms. A window may be present on any type of quartz and if you find yourself possessing such a crystal, try sitting quietly with it, gently rubbing your finger over the window, or hold the window section against your Brow or Third Eye Chakra and see what images appear in your mind’s eye. It is also a Growth Interferrence crystal which also makes it a facilitator for identifying and then removing blockages which are holding back your progress in life. Ruby Aura is produced by coating a Quartz crystal with a 1 micron thick layer of Gold and Platinum. These are two of the most powerful metallic elements in terms of crystal healing. The resulting colour, as you can see, is a deep metallic pinky/red. 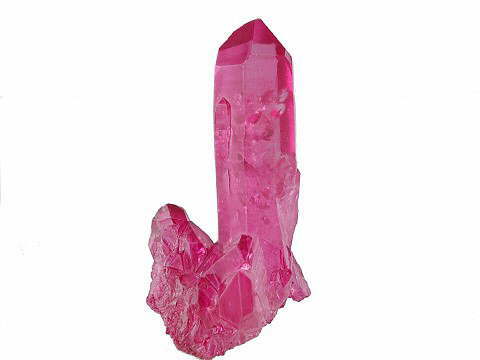 The properties most often associated with Ruby Aura are vitality and passion. It is super where lethargy is present, especially after a long or persistent illness and also for restoring vivacity and strength after grief or loss. Ruby Aura is also protective on a physical level and resonates with the Root or Base Chakra.